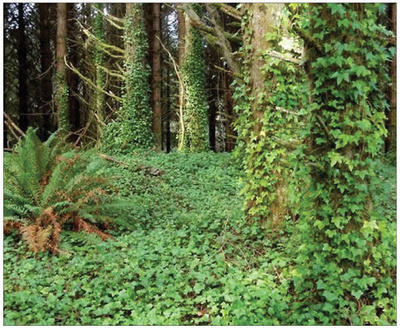 AUSTRALIA is home to the largest documented decline in biodiversity of any continent in the world.The introduction of invasive weed species is one of the reasons. Despite attempts to manage the threats to biodiversity, it is still declining. The Australian Government has set a national framework for biodiversity conservation over the next 20 years. Australia is home to between 600,000 and 700,000 species, many of which are endemic, that is they are found nowhere else in the world. These include, for example, 84% of our plant species, 83% of mammals, and 45% of birds. Australia’s biodiversity – the plants, animals, micro-organisms and their ecosystems – is threatened from the impacts of human activities. Since European settlement, more than 50 species of Australian animals and over 60 species of Australian plants are known to have become extinct. 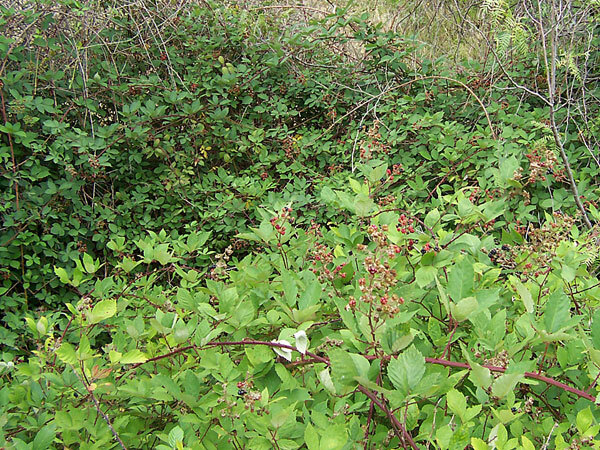 INVASIVE WEEDS SPECIES IN MAROONDAH & YARRA RANGES SHIRES. 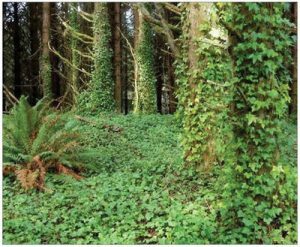 You are eligible for a Weed Wipeout tip voucher if you are seeking to dispose of the following eight invasive weed species. OTHER INVASIVE WEEDS SPECIES IN MAROONDAH SHIRES. 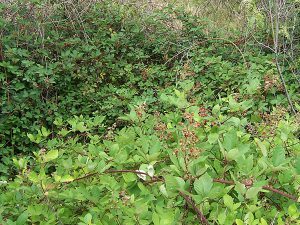 Jim’s Mowing can assist you with removing/destroying/treating these invasive weed species and can assist identify and agree with you on a course of action. In many cases if you do nothing the problem will only get worse. Land owners also have a responsibility under the Land Act to remove invasive weed species/noxious weeds from their property. Failure to act can sometimes lead to fines and costly removal action. For a list of the invasive weed species both noxious and environmental weeds in your shire see the attached websites. ACTION YOU COULD TAKE TO ASSIST BIODIVERSITY IN AUSTRALIA. • Collect and bin any fishing line/plastics you see on our beaches and water ways and save the lives of seals, platypus,birds and fish who are killed by being tangled up or eating the stuff. 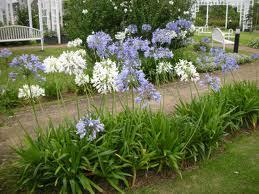 • Identify and remove invasive weed species in your garden e.g Agapanthus, English Ivy & Blackberry to name a few. Jim’s Mowing is ready now to assist invasive weeds removal from your property and our self-employed operators are waiting for your call to give you a free quote. Jim’s Mowing is an Australian owned company and locally owned and operated by people in your community and has been going since 1989 and has grown year on year ever since! We sincerely want to attack the invasion of weeds into our country and stand by for your call. Composting is the process of using recycled materials from your home to create an organic soil to add to and replenish the existing soil on your property. • Kitchen waste – Mainly produce trimmings. Think onion skins, celery roots (if you’re not re-growing them), apple cores, banana peels, potato peels. • Enormous benefits can be had by adding just a little compost to your soil. Adding compost improves soil structure, aeration and water retention. It also adds important micronutrients and increases the bacterial activity in the soil. • It’s no wonder that so many gardeners refer to compost as “Black Gold” or “Gardeners’ Gold”. There’s simply nothing better you can do for your soil than to add compost. 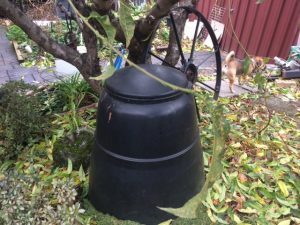 Choosing a composting bin is about finding the right bin for your size house and garden. There are many types of bins used to hold the composting materials. There are commercially made square or cone shaped plastic bins, homemade square bins often made of wood, and rotating tumbler style bins just to name a few. Choose a site for your composting bin that is level, well drained and that is easily accessible year round. 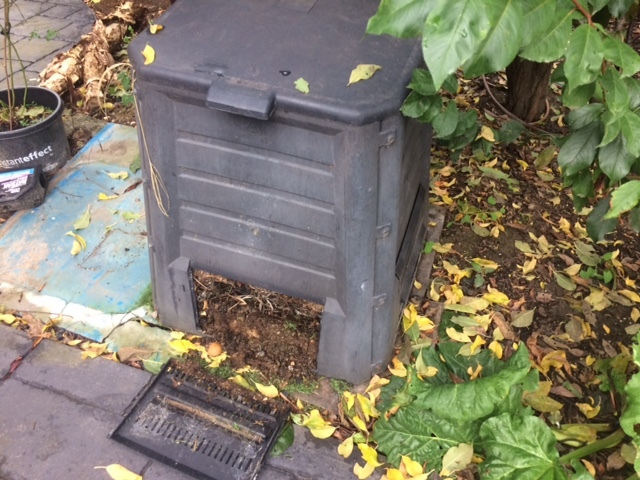 Place the bin over bare soil rather than concrete or paving to ensure that worms and other beneficial organisms can make their way into the pile. It’s a good idea to remove any grass or plants and turn the soil to a depth of about 6 – 8 inches. 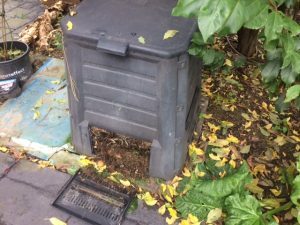 You may find that you could need to place your bin on a solid concrete base to prevent rodents burrowing under and becoming a pest. Try over soil first. Generally, composting ingredients can be divided into two categories: Brown Materials such as leaves, hay, straw and paper and Green materials such as grass clippings, fresh manure, vegetable trimmings and most green plant cuttings. See list above. Step 4: Don’t Add To Your Compost! 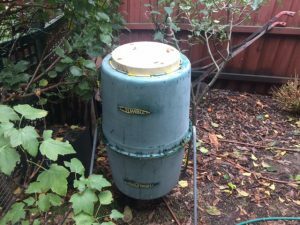 There are a number of materials that you should keep out of your composting pile. Adding the below materials to your pile is simply dangerous because of the chance of poisoning or disease. Human and pet faeces, chemically or pressure treated wood or sawdust, and meat and animal fats fall into this category and should never be added to your compost pile. Adding some items, like vegetable fats and dairy products will simply slow down the composting process by excluding the oxygen that helpful organisms need to do their job. If you add these materials you will still have usable compost, it will just take much longer. Making great compost is good fun and is a bit like making a layer cake! 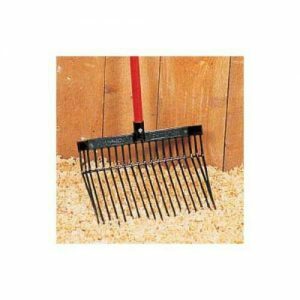 Start with a 4 ( 400 mls ) inch layer of brush, twigs, hay or straw at the bottom of the bin, this is really for drainage. Then add a 4 inch layer of brown material, then a thin layer of finished compost or good garden soil. That’s one layer. Then add a 4 inch layer of green material topped with a thin layer of compost or soil. Moisten each layer by misting it lightly with a garden hose. Keep adding materials in alternating layers of greens and browns until the bin is full. I always find it gets the composting process moving quickly if you give the finished heap a good soaking and then leave it for a week or two. In summer you may also need to water every few days to keep things moist. Once you have a full bin you can turn the pile every 14 days or so. The more you turn the pile the faster you will have finished compost! It also helps to cover the heap; it will retain moisture and keep pests off. Congratulations! Your compost is ready to use! It can take anywhere from 14 days to 12 months to produce your finished compost. The time it takes can vary widely depending on the materials and methods used. Check out the section below for tips on how to make high quality compost in record time. The point at which the compost is ready varies based on how the compost will be used. In general though, compost is ready when dark and crumbly and mostly broken down with a pleasant, earthy, soil-like smell to it. For most uses it is acceptable to have some recognizable pieces of leaves or straw remaining. Recycling these waste products and making them into prime soil is fantastic for the environment and also very economical. So well done and your house plants, flowers, vegetables and trees will thank you by growing stronger and healthier than ever. Step 7: How to make Better Compost Quicker. 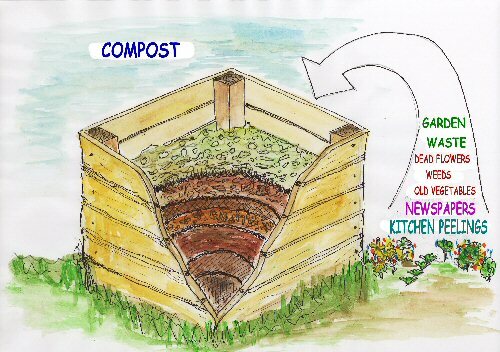 Here are a couple of hints to make your composting better and perhaps quicker. Start off with layering two to three times more brown ingredients than green ingredients. • You can also artificially aid the aeration of your pile by turning the materials, with a pitchfork or by placing them in some sort of tumbler. In fact turning is an important part of hot composting – as the composting mass heats up and more and more oxygen is consumed, concentrations of this gas within the pile can be depleted regardless of bulking agents etc, so a little help from you can be important. • The micro-organisms in your compost pile need moisture in order to survive, however not too much or they won’t be able to breathe. Ideally your compost pile should have a moisture content of approximately 50%. You can easily check the moisture content by simply taking a handful of the compost and squeezing it in your hand. It should leave your hand moist and not drip more than a few drops when squeezed tightly. Remember that the “green” materials will be adding moisture content, however you may still have to add water. If your compost pile does not have a lid, you may want to cover it during heavy rains if it already has sufficient moisture. Activators– What is An Activator?- Always worth adding an extra activator as you go! • Technically, an activator (other than the natural activating GREENs inside your bin) is high in nitrogen. Some activators come in powdered form (bloodmeal, bonemeal, alfalfa meal and other “meals” are good examples). • Other activators are enzyme-acting so that when mixed in water and sprinkled in your pile the beneficial bacteria are activated. • Still other activators, and perhaps the cheapest or most readily available, are as simple as manure (chicken, cow, goat, rabbit, etc. ), whether fresh or dry. Finally, commercial brand mixes (in 5lb/2.26kg boxes), often called Compost Starters, are available at garden centers and usually have several ingredients from the chart listed plus other high nitrogen sources. Follow the directions on the box. Call Jim’s Mowing for assistance with your composting work and make fantastic soil from recycled waste! Lawn Care has made Jim’s Mowing one of the most successful gardening businesses in the world. 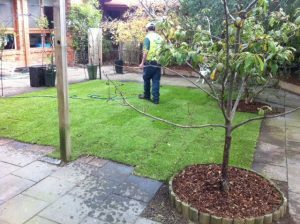 Whether your lawn is long or short our local Franchise owner’s lawn care skills can assist you to have the best lawn in the street. We can also advise you on all the main aspects of lawn care. This includes lawn rejuvenation, new turf or seed options, lawn fertilizing, lawn edging, lawn mower mulching, weed treatments, and coring and De-thatching to name a few. Our local Franchise owners can also advise you on what lawn would best suit your environment. We can offer Lawn care advice on lawns in full sun, shaded yards or areas that are dry or damp. Call Jim’s Mowing for a free quote. Has your lawn been damaged by parked cars, chemical spills, oil leaks, salt spills or foot traffic compaction? 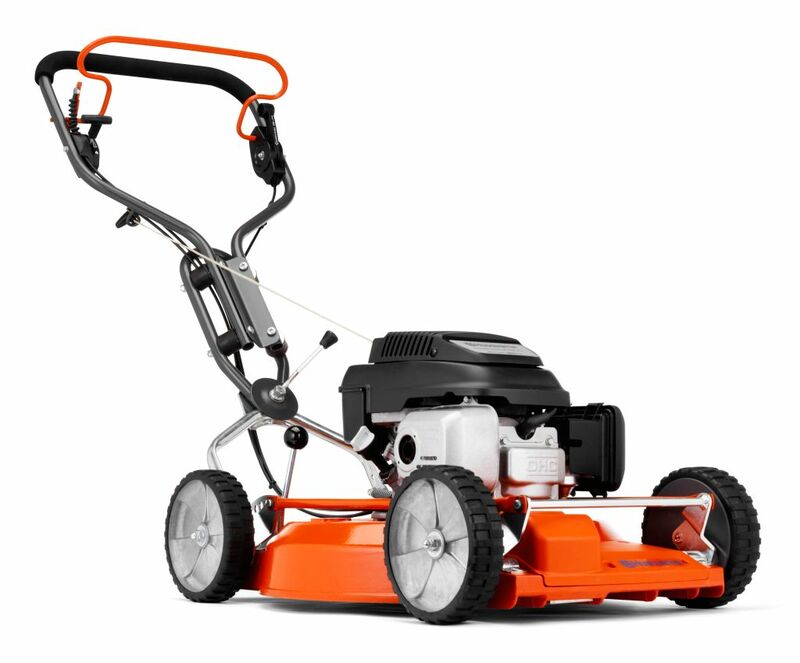 Our local Jim’s Mowing owner can offer options and advise on how best to rejuvenate your lawn. This could include coring, rotary hoeing or simply a dig over. Alternatively we may recommend fresh soil if you wish to plant new seed or turf and can offer soil tests as necessary. No project is too small or large why not give us a call! We simply love installing new turf as the results are usually fantastic. Your property maybe new or it could be old, it does not matter. Whichever type of property you have our local Franchise owner can take you thru the turf options and provide free quotes on the best way to progress. 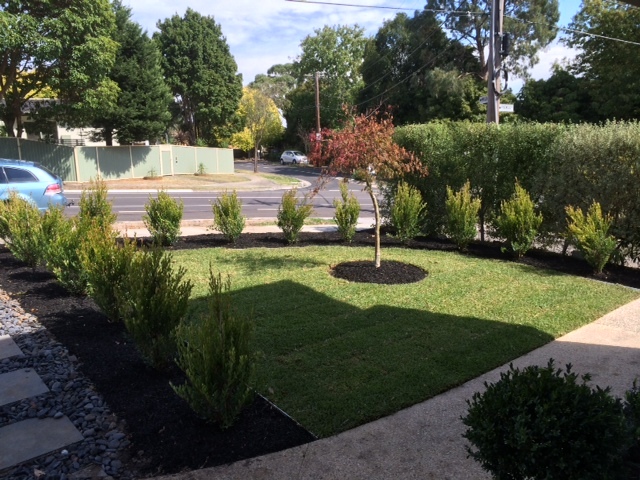 Lawn edging can really make a garden look beautiful with crisp lawn edging lines defining the garden beds and lawn. Our Franchise owners have the skills to create your lawn edging and if necessary suggest and install more formal wooden or metal edging if that is your wish. Perhaps you prefer the rambling cottage look! Well, we can accommodate that too suggesting plant and border ideas to make your garden and lawn remarkable. Why not talk to us about your Lawn edging needs? 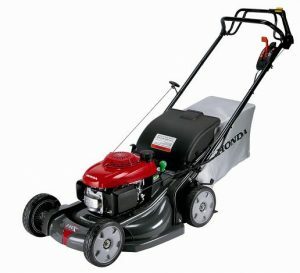 Do you know what a Mulching mower is? This lawn care mower cuts the lawn clippings finer and then spreads the clippings neatly under the mower as it’s driven along. Providing the lawn is mowed regularly you generally can’t tell if the lawn has been mulched or caught in a catcher. Plus the bio-diversity benefits to your property and the lawn are significant. 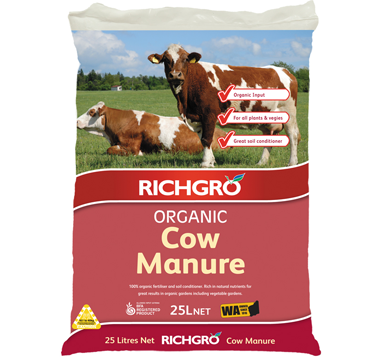 As the grass clippings De-compose they add nutrients to your soil which it turn encourages worms and birds into your garden. The end result is your lawn and garden are a much more natural place to enjoy. We can demonstrate the mulching difference, why not give us a try? Alternatively some customers still like the lawn clippings collected and taken to the rubbish tip which we still offer. Our preference though would be to use the clippings to make compost and improve the garden on the property. Whichever way is preferable to you the customer, is fine with us and free quotes are on offer. 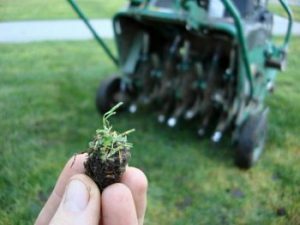 Have you heard of weed removal treatments for your lawn? Our Franchise owners have the skills to advise you on these spray on weed treatments. 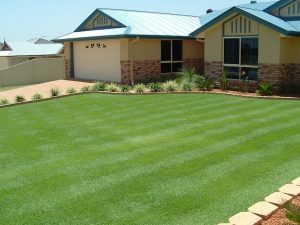 As each lawn is different and there are many invasive weeds in Australia give us a call and we can discuss the options with you and offer free quotes and ideas. Removing weeds from your lawn without harming the grasses is a great way of improving your property. Ring Jim’s Mowing on the number below for your free quote.